Whether you are an angler or just an adventurer who likes to explore uncharted waters, a trolling motor is a vital piece of equipment. The MotorGuide X5 is this year’s overall category winner, representing the best all-around choice for the average angler. Anglers seeking a entry-level technology at an affordable price should focus their search on the Minn Kota Endura C2. Skip down to read more about the Minn Kota Endura C2. Anglers seeking an impressive, high-tech choice where cost is not a constraint should take a hard look at the Minn Kota Vantage trolling motor. 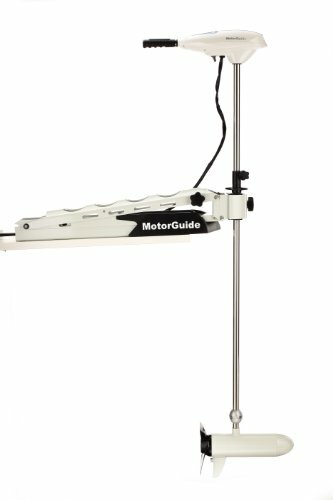 Anglers seeking a well-balanced mix of solid-state technology that will stand the test of time at a mid tier price should consider the MotorGuide Great White. Skip down to read more about the MotorGuide Great White. Anglers who’re interested in technological innovation should consider the MotorGuide Xi5 as their trolling motor of choice. Skip down to read more about the MotorGuide Xi5. Trolling motors vary in their features. At the most basic, they can serve as your main mode of moving power for small watercraft not suited the large horsepower inboard motors. At more advanced feature sets, they can serve as your means of tight, sensitive control of your boat’s movement as you fish. Understanding feature options in depth makes all the difference when choosing the right motor. The thrust of your trolling motor, measured in pounds, depends on the size of the boat, how much space you have, and the type of water you are going to be navigating. Most trolling motors are going to come with a general size recommendation. Even with the manufacturer’s recommendation, there is a general rule of thumb which is that you need 5 pounds of thrust for every 200 pounds of boat. Don’t overdo it but an extra ten or twenty pounds of thrust gives you better control in choppy water and strong currents. There are two styles of mounts for a trolling motor; a bow mount and a transom mount. The Bow mount sits at the front of the boat and is mounted by a bracket that tends to take up a good amount of room. A transom mount sits at the back of the boat and the motor head generally only points in a backwards direction. It is most often mounted by a c-clamp. As for which mount you should go with, it all depends on your boat and the applications you want to use your trolling motor. Some boats, especially small kayaks or personal pontoons just don’t have the space for a bow mount. We have an excellent review article of trolling motors that work well for these smaller vessels. There are two main methods for controlling the direction of the prop; foot pedal or hand tiller. There is a third method that is becoming more prevalent which is controlling remotely. 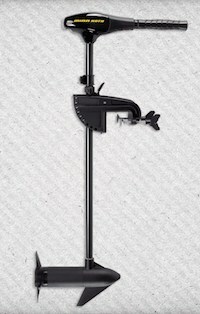 Transom motors employ a hand tiller in the majority of cases while bow mounts can be found in hand tiller or foot pedal models. While there might be some out there who argue for one over the other regarding sensitivity, it varies from model to model. Pedal models do give you hands-free use which a lot of anglers love because it allows them to fish easily while positioning the boat. Hand tillers are often favored when the trolling motor is being used as your main power source for boat movement. Hand tillers are also a little easier to become proficient at than pedal options. Another style of control that is becoming more prevalent in the trolling motor world is wireless control. 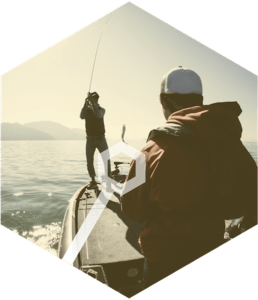 For anglers, it offers a lot of advantages Today’s wireless models usually have software that allows the trolling motor to do a lot on its own regarding positioning and trolling along specific routes. There is a general rule for the length of shaft that you need on your trolling motor. It all depends on the length from the bow to waterline or from the transom to the waterline. 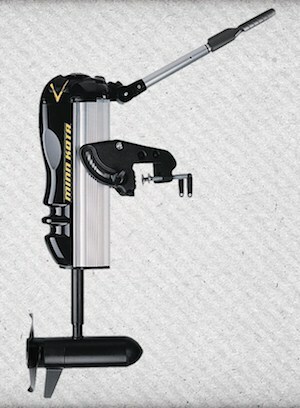 Most trolling motors have a tension adjustment on the shaft that allows you to adjust the height of the shaft. We have outlined a general guideline below for choosing shaft length. What we want to focus on here is freshwater vs. saltwater. If you are planning on taking your trolling motor out into the salt, there are some added design features that should present on the trolling motor. Material: For saltwater use you want to key in on a fiberglass composite and steel that has been anodized to cut down on corrosion. Other materials, even with cleanings after use are going to corrode much quicker. Seals: It’s near impossible to keep all the inner workings of your trolling motor unexposed to saltwater, but the best trolling motor for saltwater should have marine grade plastic that houses electronic parts that greatly cuts down on exposure. Anodes: The best saltwater trolling motor is going to use a “sacrificial anode” that protects important metal components within your motor from galvanic corrosion. These are almost always zinc, and it’s a component you should keep your eye out for when looking at trolling motors to be used in the salt. While the quality and reliability of the motor should be your main concern for a trolling motor, there are some other features that could sway you between one trolling motor over the other and can be extremely useful. Let’s take a brief look at some of these features. Directional Indicator: This is a great feature for a bow mount trolling motor where it can be easy to get disoriented when using a trolling motor constantly when fishing. Lift-Assist: Just about all of us have used the pully our entire lives to stow and deploy a trolling motor. Lift assist or some automatic feature that aids in stowing and deploying the motor is not essential, but it makes life a lot easier and should come with the best trolling motor. Battery Indicator: Most anglers with a lot of time on the water have ended up with a dead trolling motor. Whether it’s from a lot of use or just forgetting to charge the batter, it’s not a fun time and can ruin a trip. A reliable battery indicator gives you constant updates on the amount of life you have in the battery and allows you to conserve power as needed. Built-in Sonar Transducer: A lot of trolling motors now come with a built-in transducer in the motor. This makes rigging up your fish finder easier, but you should make sure that the transducer is compatible with your favorite fish finder if you already have one. All models also have a lighted directional indicator, a 2-blade weedless propeller, and the dual cable VRS steering which we will touch on shortly. There is no torque, no slack or pause when handling the motor direction and speed, and it has incredible responsiveness. If you need fine control of your motor and boat, the X5 is a can’t-miss choice for best trolling motor. The other major feature of the X5 that landed it on this review is the tough mounting bracket and shaft. The mounting bracket takes up quite a bit of room, but it is tough aircraft grade aluminum that can take some abuse. The shaft used for these trolling motors have an interesting design where it features two columns. An inner column is a composite shaft, and the outer column is a stainless steel shaft. This two column design gives you the flexibility of composite with the strength of stainless steel. These motors also feature a breakaway mechanism that is going to protect the bow of the boat in the case of impact. These features make for a workhorse of a trolling motor. Check out our full MotorGuide X5 Review. Like all of the models we will look at in this review, the Endura C2 is a transom mount motor. This motor comes in a wide array of thrust options, all of them requiring 12V for normal run time. These models include a 30lb thrust (30-inch shaft), 40lb thrust (36-inch shaft), 45lb thrust (36inch shaft), 50lb thrust (36 or 42-inch shaft), and a 55lb thrust model (36 or 42″ shaft). All of these trolling motors can also run on a 12V deep cycle battery, but using that voltage on the higher thrust options is going to mean that you have less run time. It’s all up to you, but from our experience with kayaks, a 30lb thrust trolling motor gets the job done. We think you will like the hand tiller used on this model from Minn Kota. It is telescopic and can be adjusted up to 6 inches in length. It’s as comfortable and easy to use as other Minn Kota hand tillers most trolling motor users have come to expect. From the tiller, you can easily steer your craft with precision and easily navigate through the five forward and three reverse speed settings. This is just about as basic a trolling motor as there is, but it’s honestly one of the reasons it’s a Best Trolling Motor finalist for kayaks and other small vessels. It’s easy to setup and has the reliability of a Minn Kota. It has the same composite shaft that gives you peace of mind for if you do bump underwater structures and the same engine design that provides cool and quiet power which is especially useful for anglers. We also like the lever lock bracket that mounts in 10 different positions. It is easy to lock into place and release and is made from a composite material that resists flexing well. Mounting on a kayak or other small vessel can be frustrating at times, and the flexibility of the mount is well received. This trolling motor might look a bit flimsy as it is mostly composite material, but it is a heavy and sturdy trolling motor. Overall, we give the Minn Kota Endura C2 an A rating. It’s size, reliability, and durability make it one of the best options for those looking to mount a trolling motor on their kayak. The only reason this trolling motor does not get a perfect score is that you are limited to freshwater. 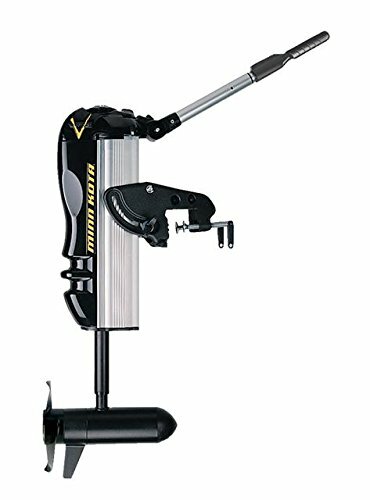 We wanted to include a transom mount trolling motor for larger vessels on this list, and we think the Minn Kota Vantage is one of the top best trolling motor options for that category. This transom mount includes a variety of new features and technology that is not often seen on transom mount trolling motors. You don’t have a lot of model options with only an 80 and 101lb thrust motor. These motors run off a 24 and 36-volt deep cycling marine battery respectively, so these are not your best bet for small personal boats. Both models have digital variable speed which helps maximize speed control and battery life. These two models feature all of Minn Kota’s motor technology that gives you a cool running and quiet motor that is needed for long days on the water and where stealth is key. For the prop, the Vantage uses Minn Kota’s Weedless Wedge 2 design. The blades are flared and swept back, and instead of taking the approach of chopping up vegetation, these blades glide through it and cuts down on the prop getting bogged down. The hand tiller on the Vantage is one of the most versatile with a maximum extension of 31” and the ability to tilt the angle of the handle up to 45 degrees. The hand tiller also serves as the control board for several features of the motor that we will get to shortly. One of the best features of this trolling motor is the ease of backtrolling. Backtrolling is a critical aspect to a lot of fishing techniques for certain fish, and the Vantage makes it extremely easy by simply rotating the directional indicator 180 degrees and snapping back into place and you have instant change of direction. Besides backtrolling, there are a lot of features that you can control on this motor from the hand tiller. You can easily trim the motor along the height of the shaft with a push of a button as well as fully stow the motor when hauling out. Overall, the Vantage gives you excellent control over the motor with its 4:1 Articulated steering you have 360-degree control of the motor head by only moving the hand tiller 45 degrees in either direction. 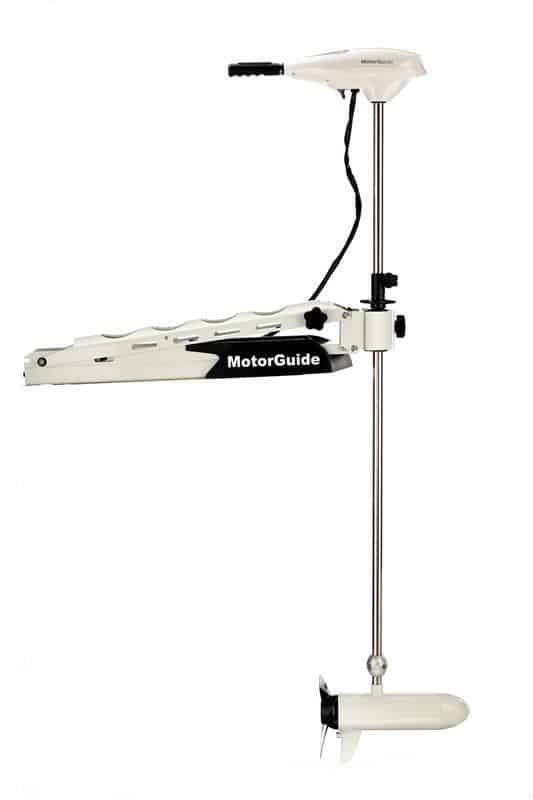 The MotorGuide Great White Trolling motor is a bow mount and is built to handle much larger vessels or choppy water with options for 82 or 109lb thrust. The Great White uses a hand tiller for control. While some might prefer a foot control, the extendable and tilting steering handle used on the Great White is highly responsive gives instant change of direction to the prop. The motor uses its Digital Guardian speed control that helps maximize the exact amount of thrust you need while conserving battery power. It also uses a soft-start technology which creates smoother start-up motion and lessens the jerkiness found in a lot of trolling motors when adjusting speed which is helpful when you need fine adjustments to positioning. Both model options come with the Machette III prop. This is a heavy duty, three-blade prop that can handle underwater vegetation with relative ease if you are working inland saltwater bodies of water where you get a lot of undergrowth. The 60 inch shaft has an aluminum outer coating that is protective against shallow water use. The shaft, mount, and other components are also anodized which greatly increases the motors resistance to galvanic corrosion. The Great White has dual saltwater anodes that take the brunt of corrosion away from more sensitive components. On top of all of this, the digital module is completely sealed protecting it from not only corrosive saltwater but also from heat and shock. The corrosion resistance of this motor is quite impressive. 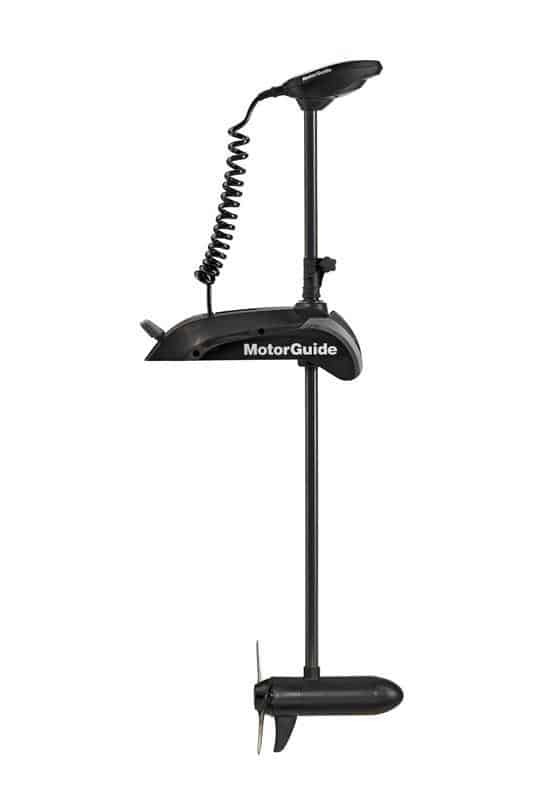 We give the MotorGuide Great White Saltwater trolling motor an A rating. While an option for a foot control would be awesome, the hand tiller is extremely responsive and can be adjusted for comfortable use. 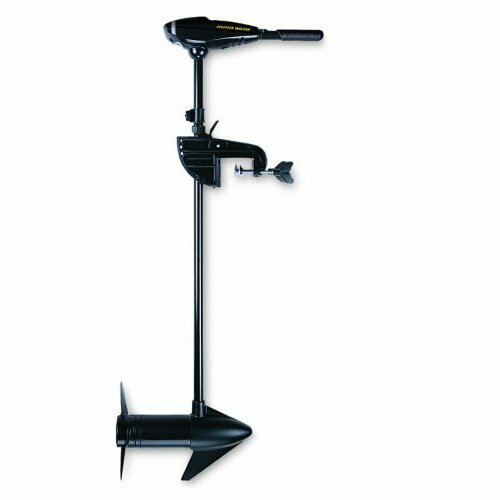 This hand operated bow mount is a great high-power, saltwater trolling motor. It has technology installed that maximizes battery life and maneuverability. While you do not get the benefit of hands-free use, its high salt resistance and reliability make it an excellent option for those needing a reliable trolling motor in saltwater settings. In all, a great finalist in the Best Trolling Motor category. We have already covered the X5 bow mount trolling motor from MotorGuide, but the Xi5 deserves its own review. While there are a lot of similarities between the two trolling motors, there are distinct differences that played a part in our final lineup in the Best Trolling Motor category. The Xi5 has a lot of model options with thrust metrics ranging from 55 to 105 pounds of peak thrust. There are also varying shaft lengths and required volts from 12 to 36V. So, there is just about an Xi5 model for whatever type of boat that you are using, barring small single person vessels. All models feature a weedless two-blade Safari prop that is excellent in vegetation. 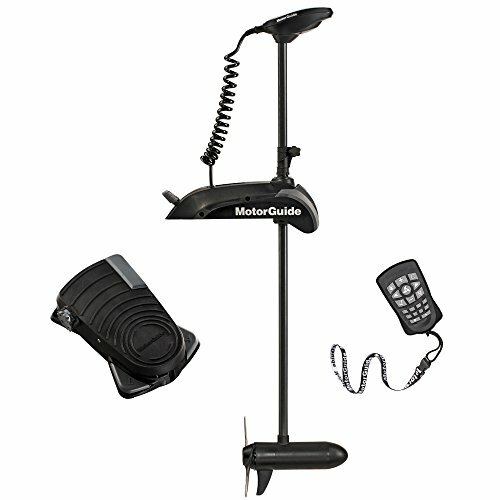 All of the models come with a wireless foot pedal with the range to work anywhere on your boat. Some models also come with a wireless remote along with the foot pedal. 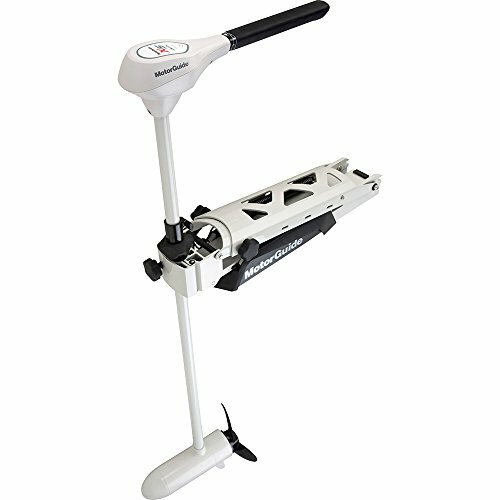 The foot pedal on this model is very sensitive, and there is no noticeable lag between putting pressure on the pedal and movement of the motor. This is also an extremely quiet motor. This steering sensitivity and quiet operation comes from a lot of new technology MotorGuide has put a lot of effort into maximizing the digital efficiency and steering transmission, and it results in allowing you to get up on the fish without spooking them. The feature that is going to garner the most attention is the Pinpoint GPS compatibility. Some models are compatible but will need components purchases separately to run the motor with GPS while other models come out of the box ready to roll. MotorGuide’s GPS allows you to fish in a whole new way. With GPS anchoring, heading lock, route mapping and playback, and cruise control, the Xi5 takes the brunt of the workload off of you. Once you have the details down, the PinPoint GPS opens up a new world of fishing. There is a lot more to like about the Xi5. It has a tough mounting bracket that is also low profile, so it does not take up a tremendous amount of room on the boat. We also like the LED dashboard on the base of the motor just above the lift assist lever. This dashboard gives you a bright and easy to read control board letting you know if the power is on and systems are ready, if the propeller is running (that’s how quiet it is), if the PinPoint GPS is on, and three-point battery indicator. We give the MotorGuide Xi5 an A+ rating. Not only does is it constructed to last, but it also has cutting-edge technology in its design. With a lot of options, there is an Xi5 for most boat types and sizes with all of them offering fantastic control. 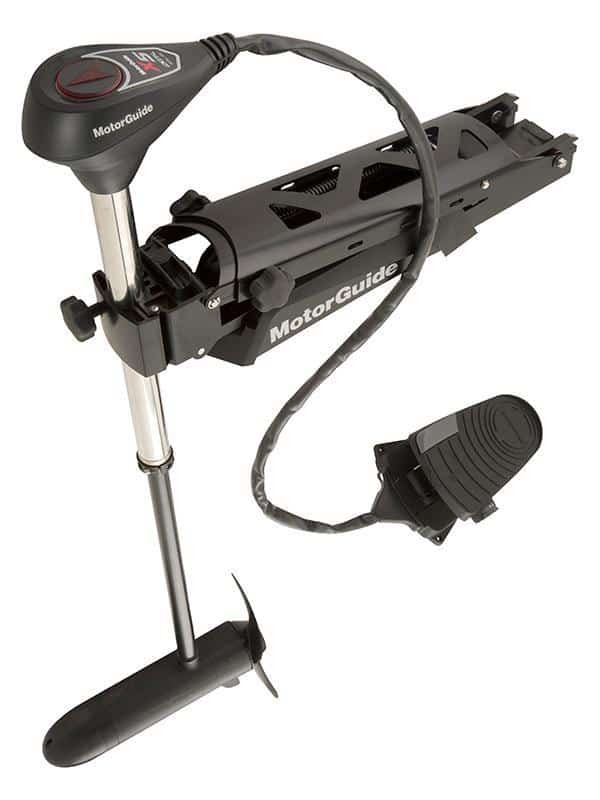 Another great entrant in the Best Trolling Motor category from MotorGuide. Check our our in-depth MotorGuide Xi5 Review. We covered a lot of information and a lot of trolling motors in this review, but we hope that we have outlined certain specs and features you need to be aware of when shopping for a trolling motor. And even though this is a small sample size of available trolling motors we are confident that any five of these motors, when matched with the right boat, are going to be a pleasure to use on the water. As you can imagine, picking one trolling motor out of this list is difficult. All of them are fantastic pieces of equipment and every person reading this might have a different pick depending on their situation. With that, we decided to go with the MotorGuide X5. This trolling motor has a lot of model options which makes it much easier to get the perfect trolling motor for your boat. This is a well built trolling motor from the shaft to the bracket, and it runs quietly with digital variable speed. Perhaps the key feature that puts it in this position is the variable ratio steering. With VRS you have ultimate control over the motor with instant response time and fine adjustments to motor direction. We always like to take one trolling motor from a best of review and mention a trolling motor that we think incorporates technology in a new and useful way. For the best trolling motors of 2018, we have decided to give this accolade to the MotorGuide Xi5 bow mount trolling motor. It’s not just the wireless aspect that swayed our decision for this trolling motor. Rather, it was what you can do with the software paired with the wireless control. MotorGuide’s PinPoint GPS is a game changer when it comes to fishing. With a few inputs, you can let the trolling motor do all of the work while you focus on catching fish. Besides the GPS and wireless control, there are other technological aspects of the Xi5 that stands out to us. MotorGuide has really improved their digital components and provided a quieter and more efficient motor. We are also fans of the LED dashboard that allows you to easily keep an eye on all of the motors systems at any time of day and night. All of these aspects of the Xi5 made it a runaway winner for the technology award.